I am a female engineer. When I introduce myself, I still get gasps or looks of surprise. This isn't a surprise to me as women account for just 11% of employees in architecture and engineering. There are a number of reasons for this, including what has been dubbed “the pipeline challenge”, that is points all along the engineering talent pipeline where we lose women and girls. At the beginning of the pipeline girls are not aware of engineering careers. There is still a perception that it’s something for the boys. As a civil engineer, people are surprised by my small stature as they expect heavy lifting when it comes to building mega infrastructure. I prefer to frame it as heavy lifting with the mind. Most of the female engineers I know entered the profession in one of three ways: their dad, uncle or another man was an engineer and was their role model; a teacher said they were good at maths and science and that’s what engineers did, so they went to study engineering; or the third category, which is where I found myself, through “sheer dumb luck”. I got lucky and really enjoyed the aspect of solving humanity’s greatest challenges as an engineer. It is why I have become a STEM (science, technology, engineering and mathematics) evangelist and co-founded WomEng to develop women engineers. Our latest campaign is to support a million girls through our GirlEng STEM education programme . I have maintained that the Fourth Industrial Revolution will bring a unique opportunity to use technology not only to overcome development challenges, but also to help women break gender barriers and become creators and owners of technology, rather than just consumers. Our programme has a number of elements, including creating an awareness of engineering careers and the future of work; providing skilled mentors for girls; providing access to local role models and funding for scholarships for engineering; and building confidence and acceptance that engineering is for everyone. The last of these elements features our pink-hard-hat transformation exercise. 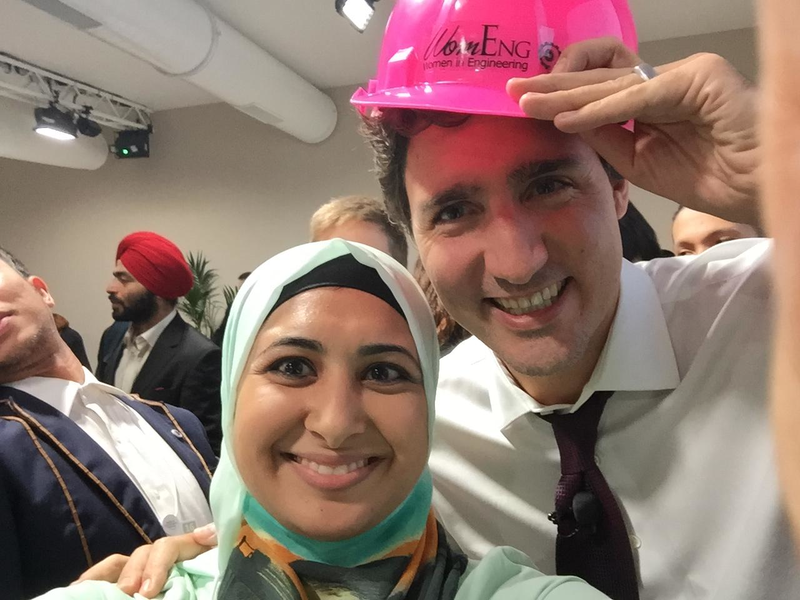 We took the stereotypical hard hat seen on many construction sites and made it bright pink – fighting a stereotype with a stereotype. This has proven incredibly effective at inspiring girls and is a coveted item that has been worn by many supporters, including Canadian Prime Minister Justin Trudeau at the World Economic Forum in Davos in 2016. We have been running the GirlEng programme since 2009 and in 2014 we saw girls, who started the programme as high-school students, graduate as engineers, proving that simple interventions can have a lasting impact. When we talk about the pipeline, however, it’s not enough to just open the talent pool at the beginning only to see it narrow very quickly. Many women leave the sector within three to five years, creating a “missing middle”. The sector is experiencing a cohort of missing female talent, which presents a leadership vacuum and perpetuates the low number of senior women in the sector. While the assumption has been that women leave to pursue other lifestyle choices like having families, another part of the challenge has been what we call the “world of one”. Being the only female engineer within a company can cause female engineers to feel isolated, and leave. A second common reason behind the missing middle is a financial one, as STEM skills are desirable and engineers are sought after by a variety of sectors where the pay is higher. Furthermore, the industry has generally been both slow to transform and welcome diversity. Many women leave rather than battle against barriers every day. When working on retention rates for female engineers, a vital approach is to engage hearts and minds. Engaging hearts comes through work that brings about change, which is largely what engineering is about, and helping to create better cities and better worlds. Engaging minds comes through championing career development for women and opening opportunities for them within companies and the sector. The sector needs to embrace other systemic changes, including providing better financial incentives and pay parity; creating an inclusive and respectful culture; and having male leaders champion the careers of female engineers. As we embark on the Fourth Industrial Revolution, STEM skills will be as vital as reading and writing. More importantly, so will skills such as empathy, teamwork and good communication, often considered more “feminine” skills. With these competencies in mind, female engineers are well placed to revolutionize engineering. To find out how gender and skills gaps are being narrowed, read Accelerating Gender Parity in the Fourth Industrial Revolution , the new whitepaper by the World Economic Forum.